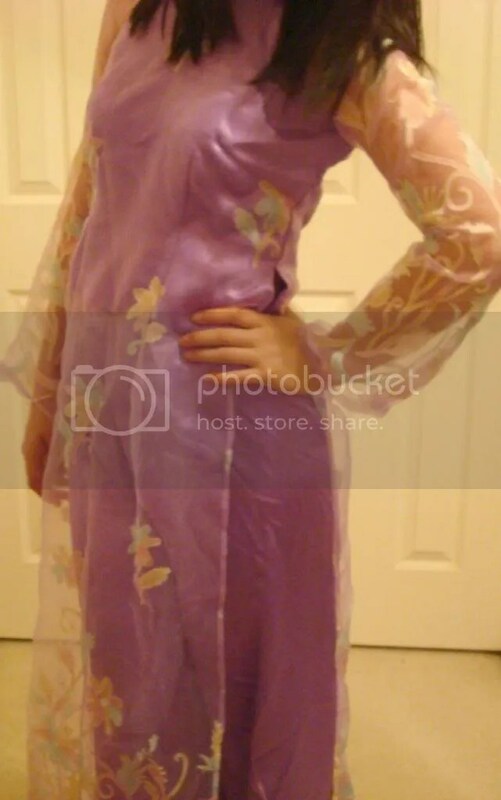 #SSP: Ao Dai is my Cultural Mask. Oh no, what’s with this new format?! Where is the awkward pose where you see a glimpse of my shoes and the left side of my body? Don’t fear; the awkward poses are still here! This is a one time deal unless something similar comes up, but I wanted to show you, not one, but 3 outfits! It would have been 4 if only I could fit the other one. 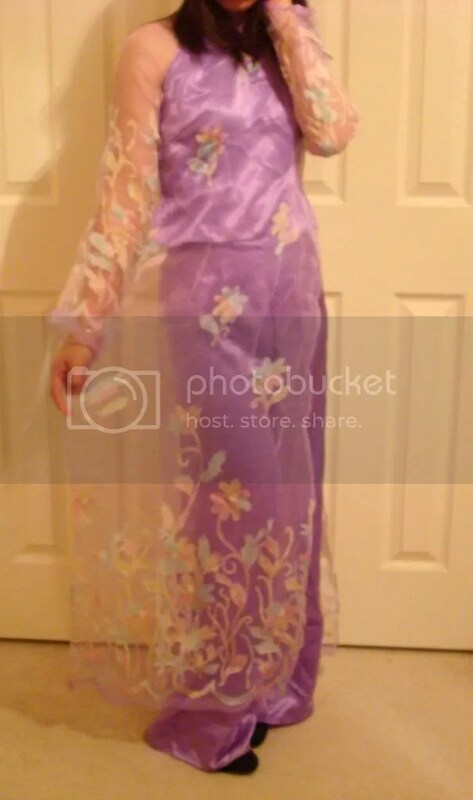 Yesterday, the Garage Sale Gods granted me with the luck of finding these ao dai. My mother has extremely keen eyes, and she saw these babies in a plastic bag. An ao dai is a traditional Vietnamese dress that is extremely fitted. The sewing and stitching of a dress are super intricate. What I love and hate about ao dai is how tight it is..it feels like I’m wearing a corset, so I can barely breathe in it. Therefore, don’t underestimate girls in ao dai; they are tough stuff. This one is my absolute favorite…not only is it in purpley-lavender, which is my favorite color, but the bottom part is see through! It’s a bit different and modern compared to the traditional ones. 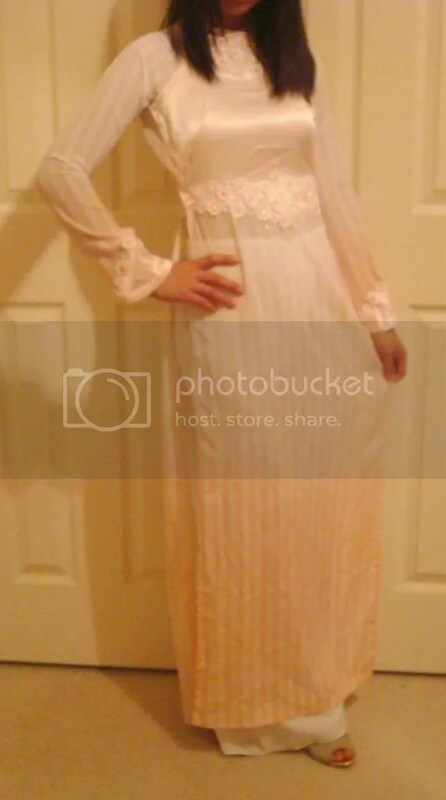 I was able to score all of these ao dai at a garage sale, but I originally bought this one first. There was a deal on all of them, but I only wanted this one because it fitted me. When I got home and went all out with my newly bought shoes, my mom was like, “Wow, you look so pretty! And it was only $5? See, this is the beauty of garage sales. Good thing we didn’t get one sewn for you. You should have gotten more!” After hearing her praises, I naturally said, “Let’s go back and get more!” We certainly did that, so we got the following plus one more for $12! This one is more on the simple side, but in person, the stripes on the bottom part of the dress are so cute. They create this ombre look that I love. This one screams flower power and if you know me, I love love love flowers/floral. It just needs some ironing and it’s pretty much good to go! 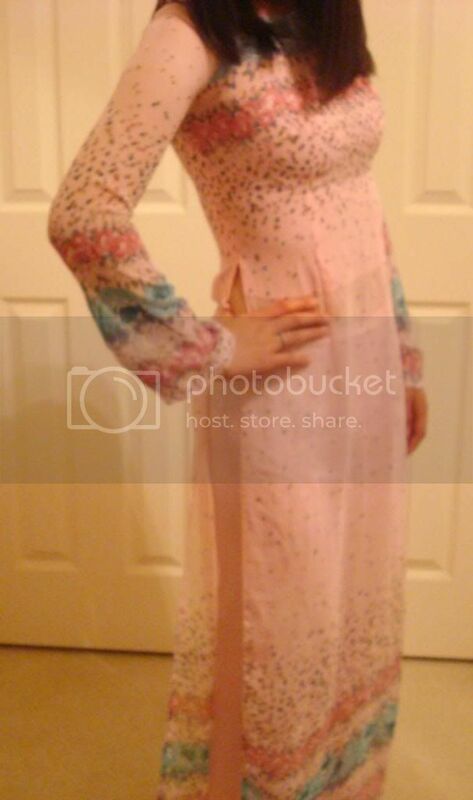 This dress is actually the one I wanted originally. When I tried it on, it was a bit tight. It was such a shame. Luckily, we went back due to my mother’s orders. When we went back, I tried this dress on one more time. Again, it was still tight, but my mom thought it was so cute, so we ended up getting it anyways. She told me that this is my goal dress, and I’m totally down to work for it. As for shoes, I paired it up with two different pairs of Nine West shoes. They are so incredibly comfy! For the first and last dress, I paired it up with black pumps that I got for $0.50! They are now my go to shoes when it comes to heels. For the second dress, I paired it up with a pair of silver and gold sparkly peep toe heels, which I got for ~$3. My ten cents #14: Expect the unexpected when it comes to garage sales. Be super duper open-minded and patient! This can be applied to thrift stores as well. My mom and I love to flaunt our frugal finds, but it takes a lot of time to find them. Not only do we consistently go out every weekend, but we wake up super early to make sure that we are your first customers. Lastly, not all thrift stores and garage sales are cheap, so be patient and move to the next house/store for hopefully a better deal. Everything takes time and practice including this. Next Next post: How I Wear It: How to Wear a One-Shoulder Dress 4 Different Ways! What do you mean by the Garage God? 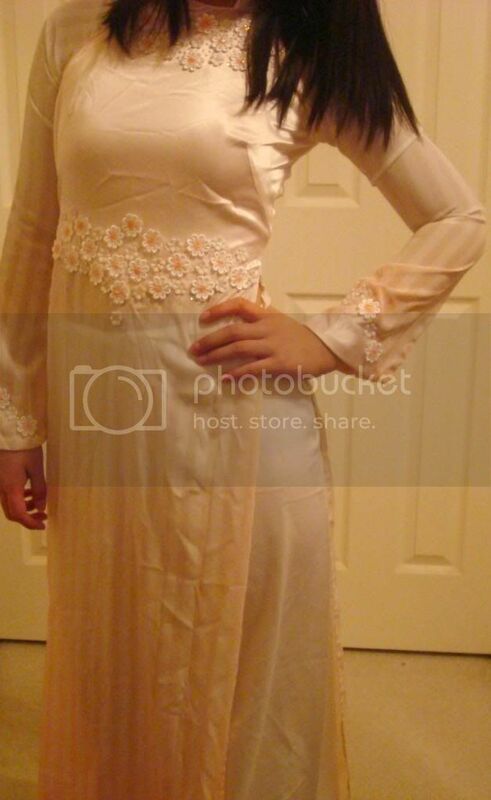 So someone threw these ao dai away o.O? Btw, the pink one is really cute, I think it looks good on you as long as the buttons don't pop out when you move. Whoops, that was a typo; I meant “Garage Sale Gods,” as in I was blessed with these purchases. The ao dai were originally part of a school club/organization and I guess they didn't need them anymore. The money that was made on these ao dai went back to the club.